Even before I’d finished Ellen Ruppel Shell’s new book Cheap: The High Cost of Discount Culture, I decided I should review it on Pocketmint. I then spent two weeks artfully procrastinating on doing so. Apparently I have a block on writing formal ‘book reviews’. I have no trouble discussing books, verbally and informally, but the moment I start trying to write about them I seize up over doing it properly. The general premise of Cheap is neatly encapsulated in the title: the ‘discount culture’ that pervades America today has a number of costs, borne by both the naive consumer (in the form of shoddy goods and false bargains) and the world at large (in the form of environmental destruction and human rights violations). Cheap is not a polemic; rather it is a measured, deeply researched examination of a cultural phenomenon — one I suspect most Americans today take for granted. President George W. Bush’s stirring call to spend after the fall of the Twin Towers in New York City on 9/11 seemed surreal to those Americans who recalled President Carter’s 1979 “sweater speech,” in which he donned a cardigan and asked Americans to turn down their thermostats to conserve energy for the sake of national prosperity and security. Having covered the history of America’s adoption of the discount mindset, Shell turns to the source of that mindset — the psychology of price. Sadly, even when we know we’re being tricked, the tricks still work: people respond differently to a $9.99 price tag than to a $10 one. We’ll pay more for a sale sweater with a ‘regular’ price of $249 than one with a ‘regular’ price of $89, even if we are absolutely certain that the $249 is inflated. And sometimes we’re oblivious to the stratagem in play. I always assumed outlet malls were rurally situated because of lower real estate costs. But no! It’s a ploy: once you’ve driven an hour or two you’re invested in the trip and therefore will buy more to justify the time and effort you’ve already spent. In many cases, we’ve been conditioned to think something is a bargain when it really is nothing of the sort. You think Wal-Mart has ‘always low prices’, right? Chalk one up to the marketing team if so: Wal-Mart has higher than average prices on a third of its merchandise. And on those items for which prices are lower? A third of them offer savings of two cents or less. Meanwhile, the rise of discount stores has lowered American wages; where department store staff salaries and benefits once totaled 18% of sales, today’s discounters spend a mere 6 or 7% of sales on their staff. Later chapters move beyond the cost to the individual consumer and into the realm of the cost to people in foreign nations (who are intrinsic to the supply chain) and the cost to the health of the planet. IKEA had begun to lose its luster for me even before I read this book, but the chapter in which Shell tours IKEA headquarters in Sweden was enough to finish the job. Artfully interspersed with the marketing-approved statements from the CEO and various employees is solid research that debunks IKEA’s claims of environmentalism and spotlights the devil’s bargain we’ve made by embracing mass-produced cheap furniture over careful craftsmanship. The cost of change, in fact, may not be nearly as prohibitive as we think. 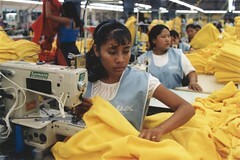 A University of Massachusetts economist calculates that, for example, increasing the wages of Mexican apparel workers by 30% would raise the price of a shirt in the United States by just 1.2%. Would you pay an extra quarter on your $20 shirt to make that kind of difference in the life of a Mexican sweatshop workers? I would, if I could trust that my quarter was actually going to Mexican workers and not to some corporate CEO. Cheap is hot off the presses with a publication date of July 2009 and statistics as recent as 2008. Shell talks frankly about the recession we’re experiencing right now, and shows some of the ways in which America’s fascination with ‘cheap’ has contributed to our current problems. Hard though it may be in a time of rising prices and falling wages, I believe it’s good to be mindful of hidden costs, and this book is a great way to start. Does this read more like a catalog of “here’s what’s wrong, and this too, and also this” or does Shell include ideas and examples of what can be done to improve the situation for most of the problems? Reading a litany of “here’s what’s screwed up” focused on nothing more than warning me that the modern world is full of screwed-up things doesn’t really sound like a great way to spend a couple of hours… I mean, I already know that I live in a screwed-up world! It sounds like this gets right to the heart of what so frustrates me about the modern economy — the vicious cycle where the pursuit of cheap drives down both prices and wages.Obviously, there’s been something of a pushback, with the localvore/buy-handmade movement, but most of the people doing that buying are the well-off with disposable income. And that’s not exactly where “critical mass” needed for change is going to come from. Wegman’s is a good chain. I worked there for a couple years and I still shop there on occasion. I love their produce! A lot of folks in our area complain that Wegman’s is too high priced, but that’s not really true – they DO have some very unusual, and high-priced products. However, they also have some great bargains every week, often beating Wal Mart and the other two local grocery stores. So I just check all the circulars and usually end up at Wegmans for the produce, the paper goods, dairy not carried anywhere else (Countdown milk), and the organic packaged foods. They also have a fab cheese dept! Wegmans is quality. In the DC area, it costs a little less than Giant or Safeway; the items that tend to cost more are deli, but the quality is so much higher than Giant that it is worth it. GreyDuck: It’s pretty obvious from reading the book that the primary ‘solution’, to the extent that there is one, is for a significant number of individuals to a) become aware of the various problems and their causes and b) consider factors like quality, longevity, source, and environmental cost in one’s purchasing choices. Shell doesn’t lay down rules (like ‘never buy imported shrimp’) but rather offers detailed information about the larger cost that lies behind cheap shrimp, and leaves it to the reader to decide on a case-by-case basis whether they can afford to ‘vote with their dollars’ for change. As with political voting, the impact a single person has on a large and complex system is usually imperceptible; the power lies in aggregation. Maybe enough people will become aware and shift their behavior enough to steer our culture and economy in a better direction. Of course, if you happen to be in a decision-making position in some retail industry, or in a position to start a small business that doesn’t adhere to ‘cheap at any cost’, then you could potentially have a measurable impact. 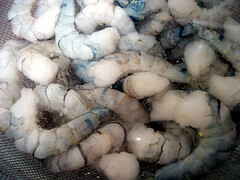 For my part, I’ve been consciously shifting my shrimp-related purchases. While I can’t guarantee that I’ll never again consume imported shrimp, I did pick the grocery that had wild gulf shrimp on sale this week (and paid a couple more dollars per pound than for imported). And at the Thai restaurant where I had no choice of shrimp source, I chose tofu instead. Stacy: I generally agree, but you might be underestimating the income-level spread of the locavore movement and/or the retail power of the population segment with a small amount of disposable income. At the moment, we are running on well under the median income for a family of four in Seattle. But I still have enough budgetary leeway that I don’t always have to pick the absolute cheapest item. I can’t pinpoint this exactly, but I’ve gotten the impression from various reading that this puts us squarely in the most sought-after demographic for the retail market. Also, there are usually multiple ways to shift your dollars, including lower-budget options. I pay a bit more for shrimp, but also replace a certain amount of my shrimp consumption with tofu, and break even on the overall cost. I can’t afford brand new handcrafted furniture right now, but instead of buying some cheap Ikea crap I can spend those same dollars on a well-constructed piece of used furniture. I just finished reading this. My interest sort of petered out toward the end (I skipped most of the food chapter as I had just read Fast Food Nation and Animal, Vegetable, Miracle). What I found fascinating about the historical bits was the fact that people have been outraged at the shift to “bigger/more impersonal” at each phase in the process, going all the way back to when the first department stores were putting the original mom and pops out of business. Honestly, I think that for the individual this is a call to spending your few dollars in the most conscious way possible. I’ve been cutting back for a year now in the food arena, but my family is managing to eat better than ever because I’m now cooking it myself with organic food purchased from a local CSA. I’m not paying more for produce, but I had to pay for all of it up front and I’ve had to do a heck of a lot more food prep. But I know what my family is consuming and I know the person growing it is getting a living wage and treating his land and his employees fairly. Also, I’ve reduced our carbon footprint considerably in this area. For that trade off, I’m willing to do the work. As far as the other cheap stuff goes, I was at a rummage sale and a couple of garage sales today looking at new merchandise selling for a fraction of what someone paid for it, probably with a credit card. What they paid for, I’ve concluded is the thrill of the purchase and the convenience of having it on hand, not the good itself. I’m fairly sure that high isn’t actually worth it. But we as a society have to retrain our brains to understand what we are actually buying and what we are doing to ourselves and our own standard of living by “demanding” this cheap crap. You can’t have super cheap goods and decent paying jobs with benefits. It doesn’t work that way. this book sounds great. i’m a big believer in “bright green environmentalism,” which is largely about creating a new kind of prosperity that isn’t based on trashing the planet or each other. “It’s not bad to own fine things that you like. What you need are things that you GENUINELY like. Things that you cherish, that enhance your existence in the world. The rest is dross. this has really stuck with me over the last few months. i was raised without a lot of room for extras, and had become somewhat of a thrift-store queen with a home full of very cute but ultimately value-less stuff. i’ve really shifted to a new way of shopping. so far this is working great. i don’t have the absolute best of everything, but i’m being mindful and prioritizing and helping support the kind of world that i want to see more of! I just got this book from the library and can’t wait to read it. Thanks for the review. I just wish there was a way to get information like this to people who really need to read it. I fear that those of us who read books like this are already socially conscious consumers. BTW, I’m not a vegetarian, but I do know that shrimp is meat. I think you’re forgetting one thing about WalMart. I am in no way a proponent, but where else can you go to find EVERYTHING at such cheap prices? Sure, they may not have the lowest of everything, but you won’t find one store to get your shopping done for such a cheap price. Consider how long it might take to go to 15 different stores in order to get the absolute lowest prices. I be the gas money alone, regardless of the time it would take, wouldn’t be worth the savings. I’m not a fan of WalMart, but they’ve been short-changed here. I often shop with a friend who LOVES sale prices, and I don’t understand how he can enter a Brooks Brothers store and think that 30% off a $150 shirt is a “good deal.” Am I wired differently? Setting a price beforehand of how much you want to spend on things help me. I have to agree with those who have already said how much they like Wegmans. I got hooked on their store brands in college in Ithaca, NY and was only half joking when I told my fiance I wouldn’t move anywhere that didn’t have a Wegmans. The produce is always fresh and the bread in bakery is one of my favorite treats. I live right near a Safeway, but I always make sure to stop by Wegmans on the way home from work because the quality and prices can’t be beat. I can’t believe how much this reminds me of The Story of Stuff by Annie Leonard. She has a great website the echos the thought that what we pay for things is not the actual price but that other vulnerable people down the supply chain are absorbing the costs of production to create an artificially low price for me. It really gives me pause when I see something really inexpensively priced at a big box store these days. The part about Walmart is a symptom of all major retail chains. I work in retail, and my job is (in part) processing price changes. The small amount of price reductions on a handful of popular items are heralded with bright red signs. The many, many price increases are done quietly and simply–a new $34.99 sticker in place of the old $29.99 sticker. All a business needs is the perception of cheaper prices. And don’t ask how many cartloads of merchandise get tossed into the trash compactor every week because a) we’re getting new merchandise in and b) they don’t want to discount the old stuff too much or people won’t buy the new stuff. With the cost of ONE cartload of merchandise thrown in the garbage, they could pay two employees a full day’s wages, yet we’re getting our hours cut back ‘because of the economy’. Customers often correctly assume that an item with an originally high price is made to a different standard of quality. Brooks brothers shirts were once the standard answer when you asked for a shirt that lasted for years, and didn’t need a lot of pressing or other maintenance. I know the $30 dress shirt I bought recently doesn’t have the same quality seams, or the no iron treatment. Wegmans is quite satisfactory, particularly if you shop the store brand items. Many of their customers are willing to splurge slightly to get whole grains, organics, or entry level gourmet food, so they have expanded the options to offer those reasonably priced little luxuries. The relatively steady prices make couponing and sale shopping a little redundant. It’s seen as “not just a retail job” because of the benefits, so you’ll get subtly more pleasant employees.